Chihuahuas are very small and compact dogs with an apple-like (or deer-like) head and a short muzzle. The eyes are large, round, and very dark. The ears are also large and erected. The body is longer than its height. The latter can be 6 to 9 inches. However, some dogs grow tall up to 12 to 15 inches. The tail is medium long and has a sickle shape; it curves over the back or to the side. Chihuahuas are generally more robust than they look. Adult Chihuahuas weigh 2 to 6 pounds. These tiny dogs make very good companions; they are loyal, alert, swift-moving, and saucy dogs with a strong spirit. 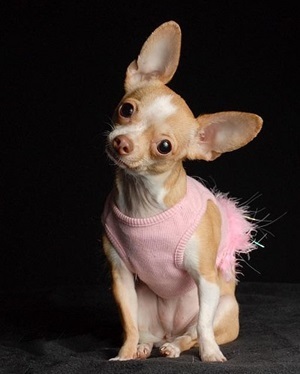 However, they had better not be kept in a house with small and impatient children because Chihuahuas are territorial and protective, and will always react to teasing. This does not mean the Chi is malicious, it simply means that it wants to protect itself. Being tiny, barking and snapping is the only ways they can use for that purpose. Also, they are very protective towards those who they love. Because of this all, Chihuahuas do need a proper socialization from a very young age. Otherwise they can become too aggressive and uncontrolled. Be sure to remain a good pack leader at all times lest the dog develops the "small dog syndrome." The Chi comes in both long and shot haired varieties. 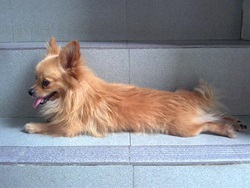 However, a longhair Chihuahua is less common. The coat colours can be various: fawn, sand, chestnut, silver, steel blues, black, white, etc, including black-and-tan and parti-colours. Little grooming is necessary for this breed. Because of the short nose, Chihuahuas may sometimes wheeze and snore. The prominent eyes are prone to corneal dryness, excessive tearing (which may cause tear stains), and secondary glaucoma. Also, this breed is susceptible to slipped stifle, gum problems, colds, stress, rheumatism, epilepsy, and seizure disorders. Do not ever allow your Chi lick or eat toxic products, fertilizer or chocolate! Make sure to provide your dog with a proper diet because Chihuahuas gain weight easily. If you are going for a walk and it is cold outside, put something warm on your Chi because these tiny dogs hate the cold and tend to shiver. The lifespan of these dogs can be 15 years or even more. Newborn Chihuahua puppies can have so called moleras ("hole in the head") - a soft spot on the skull. In fact, these are the only dogs that are born with an incomplete skull. The molera fills in within about 6 months, and a very good care must be taken before the skull completes to form. For web related enquires please contact us on webmaster@mediacet.com. *Usenet post removal: Use 'X-No-Archive' or please send proof of the poster's email, we will remove immediately. Views expressed in this community do not reflect the views of MediaCet LTD, and we are in no way liable for such content.